Set against the tumultuous background of racial politics in an unreconciled nation, the book explores Rob Riley’s rise and influence as an Aboriginal activist. Drawing on perspectives from history, politics and psychology, this work explores Rob’s life as a ‘moral protester’ and the challenges he confronted in trying to change the destiny of the nation. 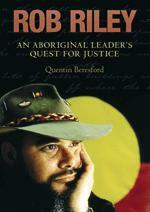 Widely regarded as one of the great Aboriginal leaders of the modern era, Rob Riley was at the centre of debates that have polarised views on race relations in Australia: national land rights, the treaty, deaths in custody, self-determination, the justice system, native title and the Stolen Generations. He tragically took his own life in 1996, weighed down by the unresolved traumas of his exposure to institutionalisation, segregation and racism, and his sense of betrayal by the Australian political system to deliver justice to Aboriginal people. His death shocked community leaders and ordinary citizens alike. Rob Riley’s belief that he had failed in this quest raises profound questions about the legacy of past racial policies, the extent of institutionalised racism in Australia and the reluctance of Australia’s politicians to show leadership on race. Much of Rob Riley’s life was a triumph of the human spirit against great adversity, and this legacy remains.